The stories in this first person perspective, point-and-click game are intriguingly written. 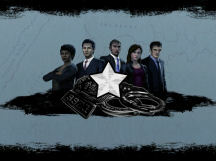 The circumstances have been tweaked so that many of the best-loved police detectives from the series manage to work together on some of the cases. 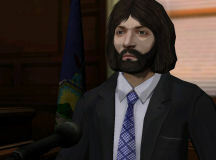 One of the present-day detectives is Olivia Benson from Law & Order, Special Victims' Unit; the other is Rey Curtis from the original Law & Order franchise. Benson is called in initially because of a crime of sexual violence -- later crimes continue this theme and also involve violence against teenagers and children. Not surprisingly, these cases include criminals with "unusual" appetites and habits, as well as tales of relatives who range from negligent to fiendish on the nurturing scale. Legacies is definitely not a game that should be played by children. I watched many of the early Law & Order episodes when they were first broadcast (the original series ran from 1990 to 2010), and the in-game portrayals of the personalities comport with the characters I remember. Detective Lennie Briscoe (who died during the television series) has the best one-liners by far in the game, suiting his down-to-earth sarcasm. Legacies' voiceovers are professional. However, none of the original actors voice their parts in the game, and the voice imitations aren't always exact. District Attorney Jack McCoy (played by Sam Waterston in the television series), for instance, is very hard to imitate. 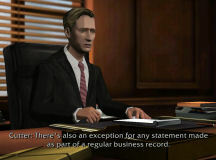 The bulk of the gameplay contains dialog of some sort -- talking to witnesses and suspects, discussing the case with colleagues, and examining and cross-examining witnesses in court (you can click through the dialogs). Characters are usually viewed from the waist up or in close-ups and, as the dialog progresses, they are seen from two different angles. The characters, their faces, and the environments show shadows and contours as blocks of color. The visuals aren't cartoonish, but the effect isn't naturalistic either, more "impressionistic." Character movement is sometimes stiff and rubbery, and the pixels at the edges of objects occasionally "dance" while the camera moves. The graphics are workmanlike -- you can identify the characters and a couple of the New York City locations -- but they don't sizzle with depth and detail. You never "walk through" any of the game's environments. 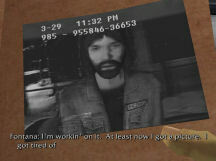 In fact, the only environmental interaction takes place at certain crime scenes, where you control the camera as you pan around looking for clues. The episodic time frames in Legacies are confusing. In the initial, present-day episode, an unsolved Lennie Briscoe case predating his death (the Preppy Jogger case) is briefly touched on. In the next episode, Lennie shows up -- we've gone back in time, and the entire episode appears to be a flashback. The flashback has very little to do with the Jogger case, however. By the seventh episode, several leaps back and forth in time have facilitated the gathering of subtle clues that might give Benson and Curtis a shot at finally understanding and solving Lennie's Jogger case. It's a good idea -- having this story arc span several years and episodes. But it's confusing because the Preppie Jogger events are woven in haphazardly, and the surviving victim in the Jogger case is a dead ringer for a completely unrelated character from an earlier episode. Legacies presents three major challenges -- searching crime scenes, remembering what was said during dialogs, and realizing what type of objection to raise in court. Thankfully, none are timed. The bulk of gameplay is comprised of multiple choice menus. To find the right answer you must remember details from previous conversations or draw inferences from these details. Transcripts are available if you can't remember, say, whether a witness lived in SoHo or Chelsea. But constantly recalling detailed conversations -- or reading back through as many as 14 transcripts per episode -- isn't my idea of fun. Occasionally the multiple choice answers exhibit some humor, brightening up the process. But before long these quizzes seem just like school work. If you aren't careful with your answers, you might be thrown back to the beginning of the interview or cross examination, etc., to try again and to improve your score (revealed at the end of each sequence). Some conversation topics are red herrings. It wasn't clear whether these add or reduce the final score. I suspect they do neither and are mere throwaways. 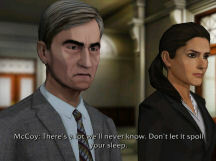 Law & Order: Legacies uses autosave only within each episode. After you have completed an episode, you can return to replay from the episode's beginning. If it's good for the iPad -- is it Good for the PC? This game released for iOS before the PC, and it plays as if it was developed primarily with the iPad in mind. Before attempting all seven episodes on the PC, I played part of the first episode on my iPad, and found the visuals to be more pleasing on the smaller screen. Compared to many other iPad offerings, Legacies is lengthy and complex. Compared to other PC adventure mystery games, however, it is simplified, repetitive, and a trifle clunky. Seven Law & Order episodes featuring the police and attorneys who are among the most prominent in the series' twenty year history. First person perspective, point-and-click interface. Stylized graphics, good voiceovers (though none of the original actors voices his/her character's part). Dialogs can be clicked through. Challenges include searching crime scenes, remembering details from dialogs, and figuring out whether and how to raise objections in court. Gameplay lacks variety and ingenuity. The game wanders close to "casual game" territory, except for the intricacy of the stories. No timed puzzles, no sliding tile challenges, no color or sound based challenges. No mazes. Autosave only. Stories include sexual violence and violence against children. No glitches. No problems with installation. About ten hours of gameplay. If you own an iPad, I recommend playing this game on the iPad rather than on the PC, as the graphics look sharper on the small screen. Aimed at fans of the Law & Order television series who know something of its history. Gamers looking specifically for an iPad crime series adventure will also enjoy it. 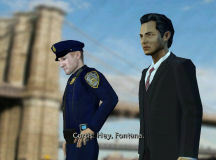 Law & Order: Legacies can be purchased via download at the Telltale Games website.